U.S. gallons or 1,000 U.S. barrels. A user’s hedge plans might be made when the company decides its next annual budget. “We often meet with companies then,” Larkin explained. “A company might draw up its annual budget in the winter and will make its hedge plans a year in advance. They’re looking at a price point, asking where risk exists for them. They look at fu- tures prices and try to plan around them.” But given the market’s vola- tility, “timing-wise, one never knows when prices will be advantageous,” he added. For The Steamship Authority, he says, “we plan during their lowest volume months in the winter, before the high-volume summer months, which have the biggest impact on them,” Larkin said. Hedging in futures can be done a number of ways. “One approach is to use perpetual hedging twelve months forward, doing it on a rolling-forward basis,” Larkin said. When a futures contract is about to expire, the position is moved into a more distant month. Larkin said. “An unhedged OSV op- erator quotes a job and fuel prices rise. And surcharges don’t necessarily work in the marine industry. “In some cases, when a user tries to offset an in- crease in fuel prices with some kind of surcharge, the surcharge isn’t enough,” he said. Then too, operators employ- ing a customer surcharge must decide whether to remove it if diesel prices retreat. 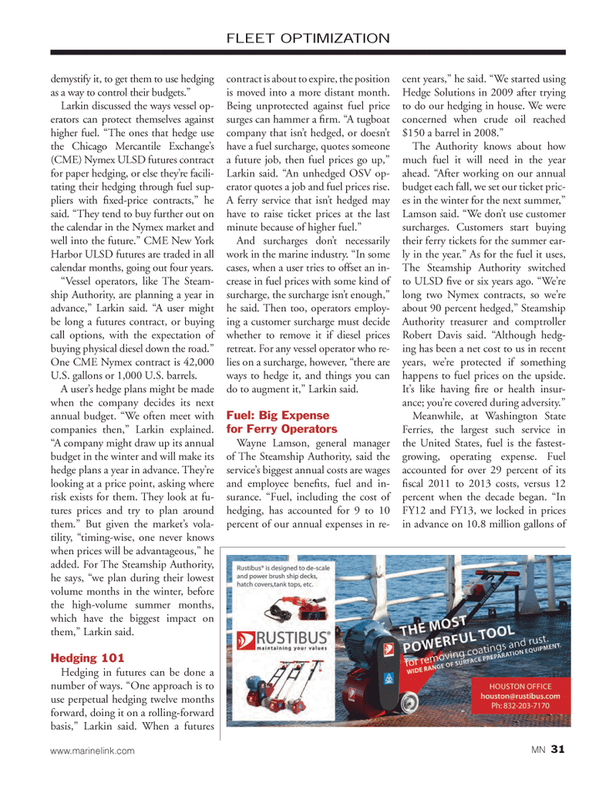 For any vessel operator who re- lies on a surcharge, however, “there are ways to hedge it, and things you can do to augment it,” Larkin said. Robert Davis said. “Although hedg- ing has been a net cost to us in recent years, we’re protected if something happens to fuel prices on the upside.